The For Grace website is seen by more than 100,000 unique visitors annually and includes tools and resources to empower women to be better advocates for their pain care and wellness. We have gathered current, relevant research materials that support the fact that women are prone to chronic pain conditions, yet are underserved in their pain care compared to their males counterparts. These materials aim to educate the general public and media about this troubling trend. For Grace has collected more than 50 powerful and provocative real-life stories that provide comfort, aid and hope to women in pain through narrative therapy. In 2004, For Grace championed a California legislative informational hearing about the under-treatment of women in chronic pain (the first of its kind in the nation.) Also, we support policy initiatives that overcome barriers to pain care. Accordingly, For Grace was the lead sponsor on a California bill that aimed to restrict Step Therapy, an unethical prescription practice used by the healthcare industry to save money in a way that increases the suffering of pain patients. Women in pain, their families and caregivers can sign this statement advocating for better pain care and compassion, while sharing a testimonial of their fight to better pain care. For Grace has assembled these easy-to-do, empowering tools and resources to help women better manage their pain, improve their care and, ultimately, enhance overall wellness. Our founder Cynthia Toussaint’s stirring memoir, Battle for Grace, chronicles her 30-year journey with chronic pain. Told with unflinching honesty and bold content, Battle for Grace aims to start conversations about the unspoken truths of the pain experience while depicting a path to better wellness and personal triumph. Our founder, Cynthia Toussaint, has recorded her first CD after losing her singing voice to CRPS for 15 years – and this testament to the healing power of music therapy is dedicated to all women in pain. Dubbed “The Wonder Project”, this nine-song collection captures the challenge of the pain experience while conveying the joy of reinvention and better wellness. 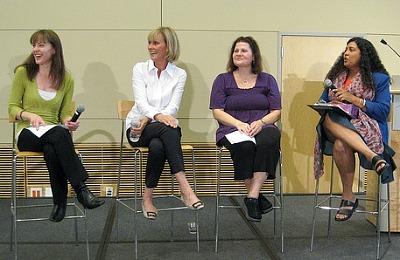 Beginning in 2008, For Grace has hosted this annual educational event attended in-person and via worldwide webcast by women in pain and their caregivers. “For women in pain, by women in pain”, the conference features renown speakers and panelists who promote self-care practices that engage attendees to take control of their wellness. Understanding chronic pain and the health benefits of an effective treatment regimen, along with responsible adherence to therapies, is emphasized as well. ABC World News Now, the Discovery Channel, The New York Times, The UK/London Times, Woman’s Day and More magazine are a few of the many media sources we’ve generated features in that have brought pain care gender disparity awareness to millions around the world. For Grace has assembled a team of leading pain experts who can speak about the gender disparity issue from a personal, clinical and research perspective. Launched in 2008, this attention-grabbing PSA addresses the troubling issue that “women hurt more and are helped less.” It has reached tens of thousands worldwide via the Web. Starting 2019, For Grace partnered with The Mighty’s worldwide community to educate, inspire and empower women in pain. Founder Cynthia Toussaint will host and interview a different miracle maker each month, many who have survived impossible odds to go on to make the world a better place for women with high-impact pain.